When it comes to my department at work, food is a very important point for discussion. We are all big foodies, and often swap recipes and stories just before the start of our weekly meetings. This past week, we had our annual team retreat to brainstorm strategy, content, and the next steps in everything we do as a department. The retreat was held in my apartment, and I took this opportunity to showcase two delicious vegan dishes I’d been wanting to try: Kale Salad with Avocado and Sweet Potato and Tuscan Stuffed Mushrooms with Pine Nuts. Kale is a power food that is often left behind – it’s more bitter than your average green, and has a tougher texture as well. That being said, it is loaded with vitamins and nutrients to the max! My solution to bitter greens is finding the right balance of a) sweetness or b) salty goodness (like bacon, which makes most things taste amazing). 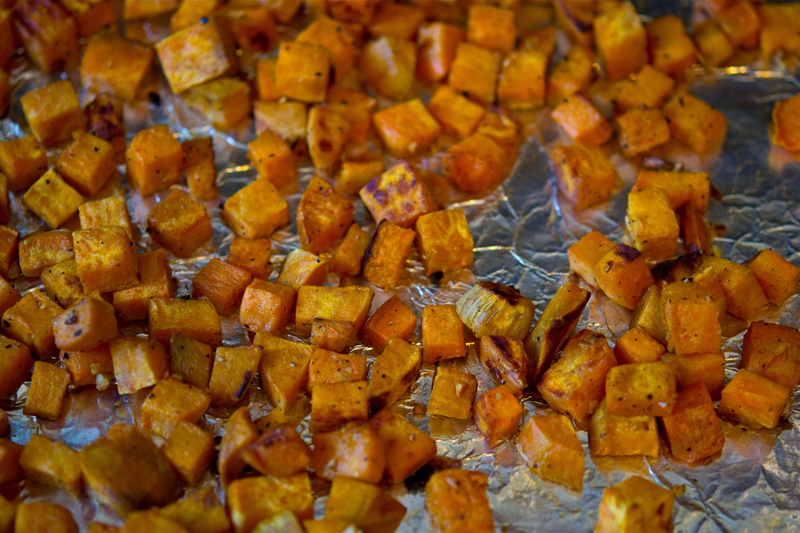 I vied for sweetness with this salad and chose my southern favorite: the sweet potato. 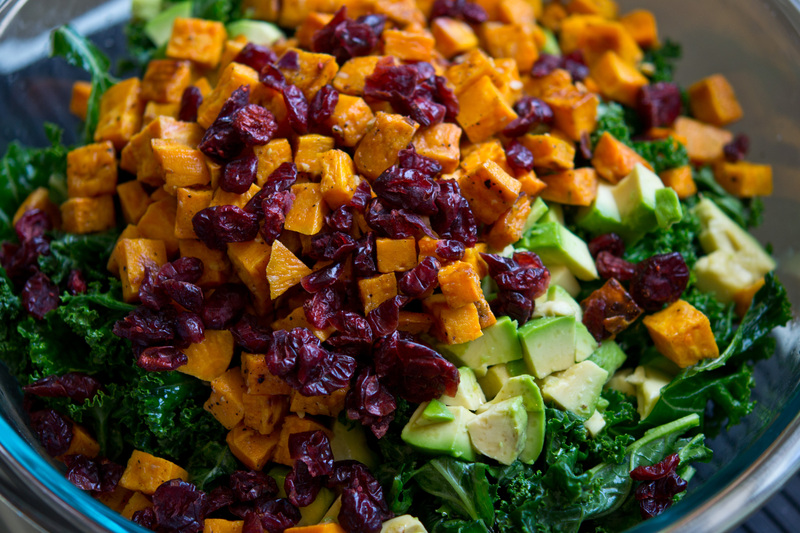 Creamy chunks of avocado and a sprinkle of dried cranberries made this dish a true winner – click HERE to see the recipe for this healthy, nutrient-rich salad. Mushrooms are also a food with its fair share of both fans and critics – some people swear by their earthy taste, while others can’t stand it. I grew to love mushrooms during my veggie days, and (thankfully) never lost that appreciation. 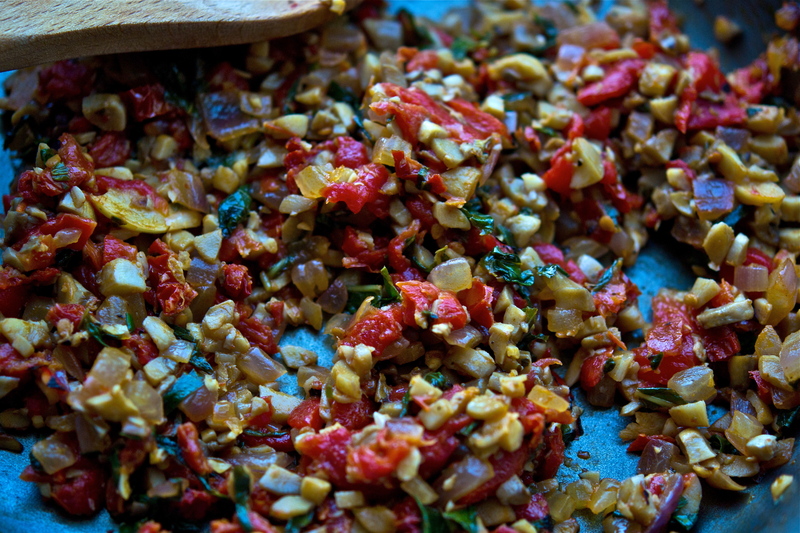 You can make any stuffing for mushrooms, from a nutty quinoa salad to a spicy sausage filling. 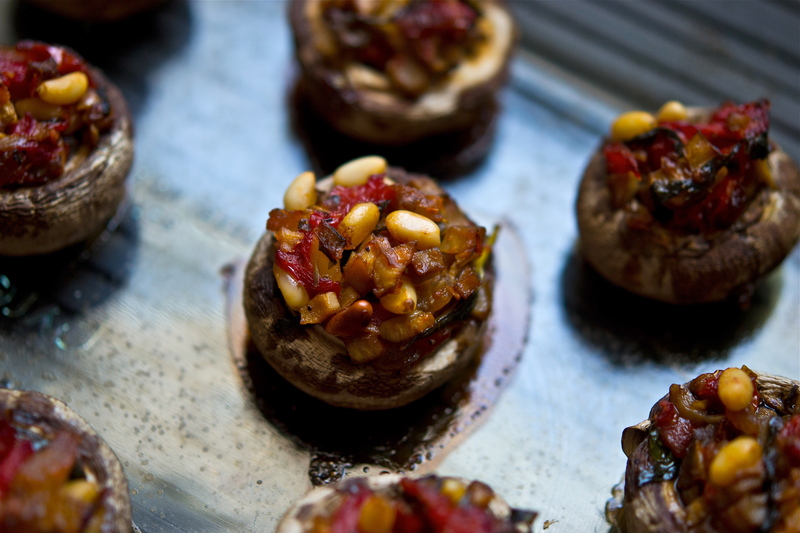 Based on what I had on hand, I took a little inspiration from Tuscany for these and stuffed them with sun-dried tomatoes, roasted red pepper and fresh basil – click HERE to see just how simple and delicious these can be! 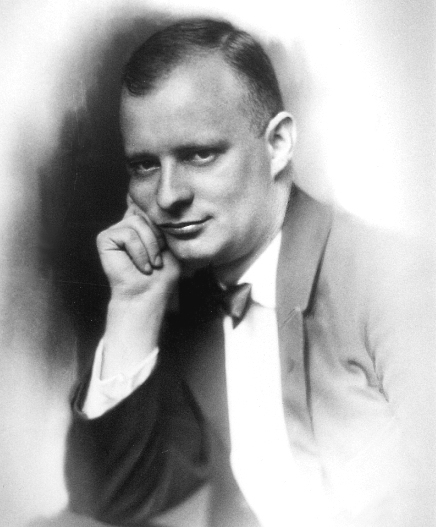 There are a number of composers whose critics are just as vocal as their fans, but the one who especially comes to mind (for me) is Paul Hindemith. The reason for this choice is his musical departure from diatonic tonality, resulting in harmonies based on free-form scales and notational structures. In fact, there are currently music teachers who refuse to even teach Hindemith given their own aversions. For this pairing, I chose the Viola Sonata, Op. 11 No. 4 – it is the fourth of his sonata series, and perhaps one of my personal favorites (though others, as expected, would disagree). The sonata has three “movements” that are performed without pause. The first is “Fantaisie”, and takes harmonic experimentation to a whole new level – it navigates through nearly ten different keys over just 41 bars! This is perhaps my favorite of the three movements, being extremely beautiful and almost haunting in character. The second, “Thema mit Variationen,” is much more playful and energized. It changes the established downbeat throughout, allowing the melodies to flow without rhythmic constraint. The final movement, “Finale (mit Variationen)”, unleashes a series of classical forms that bring the piece to an uncertain yet glorious conclusion. Overall, it’s a very cool piece that some people love, and some people hate. My friend Erin Nolan (violist) said one of her instructors recommended to approach Hindemith as one would approach Bach: in a methodical manner…so perhaps I can recommend to try cooking kale as you would spinach, and mushrooms as you would meat – just a thought 😉 The recording below is by a violist Erin recommended for his beautiful tone, and I definitely agree: Lawrence Powers. Enjoy!